Pham is one of the biggest acquisitions for EVP this year. 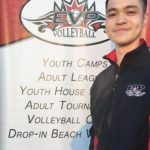 Very well known in the GTA volleyball community as an elite level setter, Pham has decided to move forward with his career into coaching. Although it will be no easy task, Pham is taking on a head coaching position for the club right away, given his years of experience at every level of the game. Known for his standout defensive abilities, ability to run an elite level offense and leadership on the court, Pham will be looking to lead a young 13u boys program and compete in the OVA for the first time as a coach. Pham is no stranger to competition, having won medals at OFSSA and ROPSSAA during his time at Rick Hansen Storm alongside EVP Head Coach Robbie Bodanis. Pham recently led his Durham team to their highest place finish at the OCAA Provincial Championships, where they upset the #1 nationally ranked team, the Fanshawe Falcons in the semi finals. Pham expects to help his team fall in love with the sport, as he cites volleyball to be a very difficult sport to play, and just as difficult to love. However, love for the game translates into passion, and passion becomes time dedicated towards growth. Pham also shares his reason for coaching, mainly being that it was time for him to pass on all that he has learned towards the next generation.